Assemble at Cochin Airport at 0630hrs. Departure from Cochin by Emirates at 0940hrs Arrive Dubai at 1210hrs, transfer to the Hotel. Enroute Lunch. In the Evening, proceed for Dhow Cruise (19:30hrs – 23:00hrs) for a fabulous relaxing evening join our traditional Arabian dhow for an evening’s cruise on the Creek. Enjoy a sumptuous feast of Arabic and International cuisine while gently gliding past illuminated souks, banks and palaces. Overnight at Hotel. Afternoon proceed to Desert Safari. (15:00hrs – 21.00hrs) approximately. 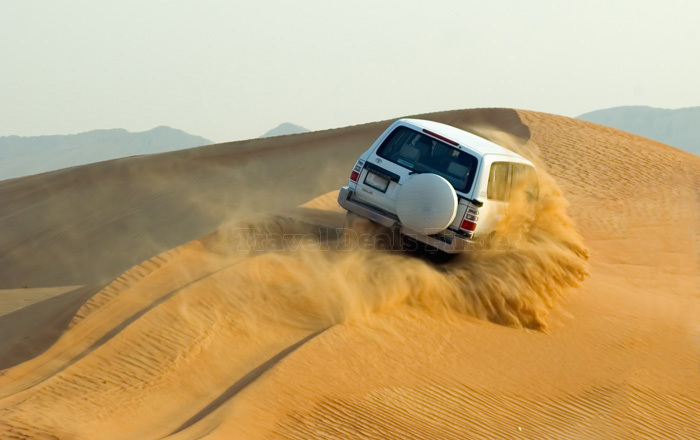 This tour departs in the afternoon across the desert with photo-stops during an exciting dune drive and visit the camel farm. The drive continues across the desert. Watch the beautiful sunset in the desert. Reach our campsite, where you have the opportunity to do camel riding, sand boarding and try out a henna design on hands or feet. After working up an appetite enjoy a delicious barbecue dinner and a shisha (the famous Arabic water pipe). Before returning, watch our belly dancer performing her show. Back to Hotel.Overnight in the hotel. After Breakfast day free for leisure own activities and shopping. Afternoon proceed to Global Village. Over night at Hotel. Rs. 45,500/- Per Adult on Twin Sharing basis. Any increase in airfare, airport taxes which may come into force prior to operation of the scheduled journey. Expenses of personal nature such as beverages tips, laundry, porterage & any other item not included in the tour price. If you have not decided yet or wants to customize tour itinerary or hotels listed above in "Dubai Shopping Festival Tour Package", then we can change the travel itinerary and make a personalized, tailor-made holiday package, especially for you. We can modify this travel package as per your itinerary, budget, duration and the tourist places you would like to visit, including transportation and airfare should be included or not. Please fill the form below to contact us.